The Arizona Centennial 2012 Foundation / Commission is putting up billboards promoting the centennial and featuring their logo. The billboards also state: DAZZELING, History still in the making. Unfortunately, it would be more accurate for the billboards to simply state; DESTROYING History. Their “number one signature project” or “centerpiece project” as it has been called at various times completely displaces the top rated had historic Arizona mining and Mineral Museum. They are actually destroying a world recognized centerpiece of Arizona history for the centennial. We are proud to introduce this plan for a new facility in downtown Phoenix that celebrates the Arizona Centennial in 2012. Someone once said, “It takes a thousand voices to tell one story,” and nothing could be truer about Arizona. Together, many stories make up the past, present, and future of the state. The Arizona Experience interprets that thread through the eyes and words of the people who shaped it and those who are writing its next chapter. It is about frontiers—from the unsettled West to the mysteries of the human genome to the far reaches of outer space. And it is about the innovative spirit they bring to every endeavor, from art and agriculture to technology and sport. Through compelling storytelling, immersive environments, and fun interactives, The Arizona Experience will challenge, engage, and deepen visitors’ understanding of the Grand Canyon State. Someone in the Centennial Foundation / Commission (or perhaps the Arizona Historical Society, administrator for this new “museum”) has apparently been chewing on or smoking some happy weed. 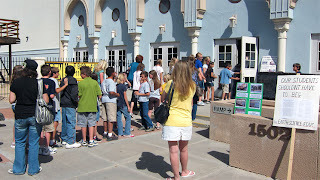 The second post on this blog (June 7, 2010) reviewed the ratings for the Arizona Mining and Mineral Museum. It has been placed on over a dozen lists of best museums and best attractions in the Phoenix metropolitan area. That is a most remarkable achievement for a state museum that operated with only one state paid employee. The extraordinary success of this museum was achieved by volunteers and with self-generated funds. More recently, the mineral museum received further recognition. It is on US News Travels list of 12 Best Things to Do in Phoenix. So how is Arizona responding to this recognition? Closing it so that the building can be available for a 5C Arizona Centennial Museum (AKA Arizona Experience) that has absolutely no chance of ever being open for Arizona’s centennial. Closing it for a $15 million 5C museum that may never be completed because just over 10% of the necessary funds have been raised to date. Closing it for a new museum that, if finished, has close similarities to the $30 million failed Marley Center Museum in Tempe. Closing it for a museum with similarities to the History Museum at Rio Nuevo that failed before being built (but not before eating up $1.4 million in design fees by out of state contractors). Closing it for another museum operated by the Arizona Historical Society which has never produced a top rated museum in spite of having many across the state and a $6 million budget. Closing it for yet another history museum which will be just two blocks from the Arizona State Capitol Museum (a history museum with unused floor space). Closing it for a museum which will devote considerable floor space to the cockeyed idea that “history is learning and imagining the future”. Closing it and eliminating the popular and essential K-12 earth science education programs. Closing it and destroying a part of Arizona’s heritage that began in 1884. Closing it and eliminating a museum featuring a Copper Gallery in the “copper state”. Closing it and possibly scattering or destroying an irreplaceable, world class mineral collection. Why create a plush private party pad for politicians? In days of yore, when Arizona became the 48th state in 1912 and lawmakers proudly wore "copper collars", the old Adams Hotel in downtown Phoenix was the true center of state government. The copper companies, with vast mines at Jerome, Ajo, Bisbee, Globe/Miami and Clifton, would lease vast suites in the Adams to which all portly and pretentious legislators were welcome to indulge in an endless supply of food, booze and perhaps even other "benefits" rented from the adjacent playpens in the "Deuce" neighborhood. It helped ease the expenses for lawmakers from outside Phoenix when attending legislative sessions. The benefit to the copper companies, of course, was a favorable Arizona business environment. Those were the good ol' days. In recognition of the Centennial of Arizona statehood, Gov. Jan Brewer and state legislators now want to spend $15 million to recreate a symbol of those days in a more modern setting closer to the state capitol. They will start by closing the Arizona Mining and Mineral Museum, one of the nation's finest mineral museums and an always popular destination for thousands of schoolchildren. In place of the mining and mineral museum, the announced purpose is to create a "5C Arizona Centennial Museum". The official proposal is for a "Five C's Museum" to highlight Arizona's long forgotten copper, citrus, cotton, cattle and climate economy. It will be the second state government museum at the capitol. The first is the reconstruction of the original state capitol building, now a four-floor museum of Arizona history, culture, economy and politics. It’s two blocks west of the proposed new museum. Why a second Arizona history museum? The new museum is expected by some to become a "Copper Collar" days revival as a reception center, party site and watering hole for formal and informal legislative and gubernatorial functions for local and visiting dignitaries, politicians and lobbyists. In everyday terms, it will be a "plush private party pad for politicians". Instead of "Five C's", the new facility will likely become the "Five P's" center. Instead of going downtown, lobbyists will be encouraged to sponsor parties next door to the legislative chambers. Think of it as saving travel time and thus contributing to greater efficiency in government (or lobbying). In terms of impact, consider the accounts of gifts and "educational trips" provided by the Arizona Fiesta Bowl to numerous politicians. The Fiesta Bowl is merely one of hundreds of groups that hire lobbyists. As the Fiesta Bowl scandal shows, laws covering political contributions are rigorously obeyed once the nature of the "gifts" is made public. Until then, such licit and illicit "treats" remain suite secrets. It's why no final concept of the new proposal is available; display of a proposed plush private party pad for politicians is hardly the way to develop public or corporate support. As a result, fund-raising is noticeably slow; corporations with the ability to contribute significantly to a $15 million "Five P's" project are reluctant to be associated with closing one of the nation's finest mineral museums. Sadly, the original Adams was torn down. Copper collars are no longer worn with pride by Arizona legislators; instead, "educational trips" to elite sports events are favored. It's helped make the Arizona legislature one of the nation's premiere institutions in support of out-of-state trips to observe "higher education" on the playing fields. Because we don’t wish to “warehouse” material thereby making them inaccessible to the public, working with others, we are developing plans to place displays at appropriate public locations and museums around the state. The historic pieces of equipment and world class mineral and gem collection will remain prominently displayed. These objects are after all, the heart of any exhibit or program reflecting the importance and history of Arizona’s mining industry. Using modern display techniques, there is ample room for the continued prominence of the mineral exhibition. We understand that one of the reasons this collection is “world class” is its comprehensive and integrated nature. Separating these valuable specimens would diminish both their value and impact. Judge Jones is the president of the Arizona Centennial 2012 Foundation which has placed the sole source contracts for designing and building the centennial museum for the AHS. 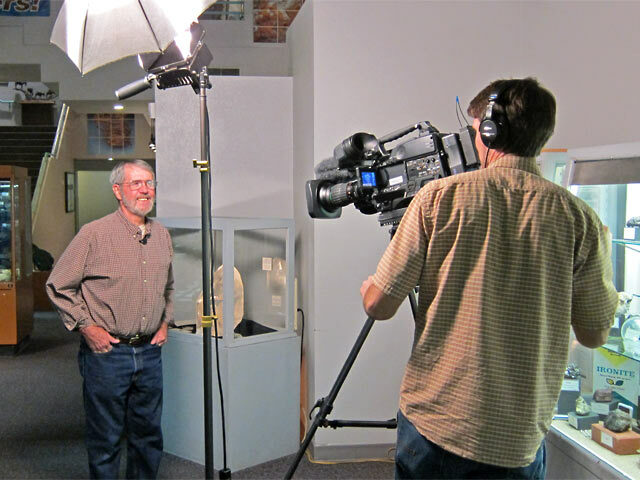 On February 14, 2011, Arizona’s 99th birthday, KAET Channel 8s Horizon program took a look at plans to celebrate its 100th birthday. They reviewed the Countdown to Arizona’s Centennial with guests Karen Churchard, Director of the Arizona Centennial Commission, and Catherine May, Vice President of the Arizona Historic Advisory Council. Neither guest revealed the Commissions “number one signature project”, the 5C Arizona Centennial Museum. Acting on tips that the “best” centennial project was being hidden from them, Horizon invited the Director of the Arizona Historical Society to explain the centennial museum project. She was interviewed on Monday, April 18th. In long and rambling answers to direct questions, she presented a fuzzy vision of the centennial museum (AKA Arizona Experience). Incredibly, she described it as not so much about Arizona’s history as about Arizona’s future. In a truly astounding statement for a historian, she defined history as “about learning and imagining the future”. 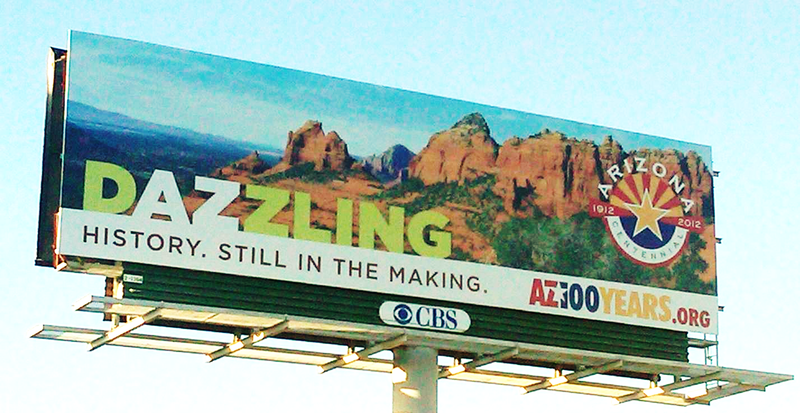 She also redefined Arizona’s centennial celebration as an event extending through 2012. Most people think the celebration began on February 14, 2011 and will culminate on the centennial, a year later. This redefinition of the centennial celebration appears driven by the painfully obvious fact that Arizona’s “centennial museum” cannot possibly be open for Arizona’s centennial. It may not even open anytime in 2012. It may never open, because it is not yet funded. Two segments of Tuesdays Horizon program explored the penalty Arizona is being asked to pay for a centennial museum that will not really be part of its centennial. Centennial museum planners intend to displace the entire top rated and historic Arizona Mining and Mineral Museum at 15th Avenue and Washington Street in Phoenix. It’s decades old and very popular K-12 earth science education programs will also be eliminated. No trace of the mineral museum is expected to remain except a single display with a small percent of the mineral collection. Obviously, there is bitter opposition to this plan, especially among teachers and students. Horizon provided an overview of this opposition. For nearly two years, centennial museum planning has proceeded in secrecy. Details are still secret. Perhaps the sunlight finally exposing the centennial museum plans, or lack thereof, will kill it before taxpayers are saddled with another useless, high dollar museum like the Marley Center Museum in Tempe. Perhaps public awareness will yet save the children’s beloved mineral museum. The links have been verified. However, it they do not work, go to the KAET 8 website. Click on “Horizon”, click on “archives”, and select the date. 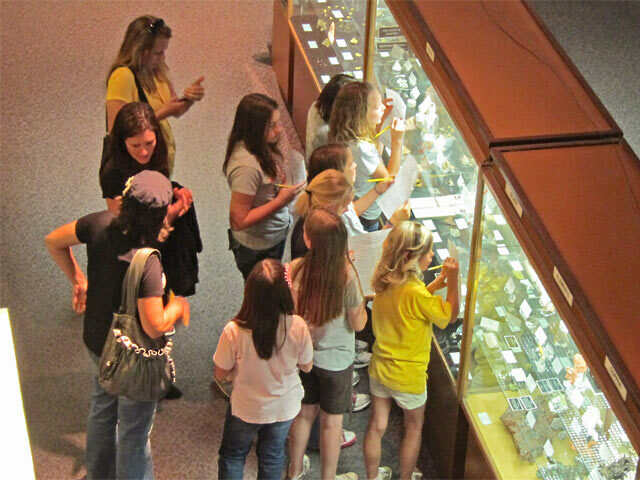 To prepare one of their program segments, KAET 8 visited the mineral museum on Friday, April 15th. The three photos on this blog post were taken by a mineral museum supporter during that visit. As explained in prior posts, a compromise was negotiated following the Arizona Centennial Museum controversy in early 2010. Following the supposedly democratic process, the centennial museum bill was amended to protect and preserve the mineral museum within the centennial museum. In April 2010, Judge C.E. Jones published a "My turn" editorial in the Arizona Republic assuring students that the new law would be followed. Now, a year later, the Arizona Historical Society and the Arizona Centennial 2012 Foundation are defiantly ignoring portions of the law that they do not like (Judge Jones is president of the Foundation). Their preliminary plans virtually eliminate all traces of the mineral museum. Even worse, they absolutely refuses to discuss what will become of the mineral collection and mining artifacts. The AHS has even terminated the K-12 earth science education programs. If the AHS has their way, future Arizona students will be deprived of this lifetime learning experience. Last year Governor Brewer announced her “Birthday Gift” to the State of Arizona as the AZ Centennial Museum. It was to replace our current AZ Mining and Minerals Museum, which emphasizes the Earth Sciences being taught in our state. We worked hard with the science community in protesting the proposed AZ Centennial Museum, as it would be just another history museum. We encouraged the amendments to HB 2251 that “housed” our Mining and Minerals Museum and kept the displays and historic equipment under the AZ Historical Society. We were so proud to have played a vital part in the solution that allowed a Centennial/Mining and Mineral Museum, “this was a democracy in action.” The bill passed and the Governor signed it. We thought our museum was safe. WRONG!! It will be closed on June 1, 2011. The AZ Historical Society did “house” our Mining and Minerals Museum this year without cost to them, because our museum is nearly self-supporting. Now we hear that the Governor, and the AZ Centennial Foundation are breaking the law by closing the Mining and Mineral Museum on June 1st. They changed the idea of “housing the minerals” and are now using the word “transforming” with pictures showing our AZ Mining Minerals Museum gone, not even mentioned. 1. We have re-read our Arizona Government policies, and simply cannot find giving “birthday gifts” that cost taxpayers $14,000,000. 2. We could not find anything that said it was OK for the Governor, or any organization that receives money from the taxpayers, to choose not to follow the state laws. 4. Why is AZ celebrating our Centennial by destroying our Mining and Minerals Museum? Please Help Us! Can the Arizona Historical Society even manage an adobe hacienda? Arts Marketplace, along with this company of supporters, worked together to create a plan to restore the C.O. Brown House, activate the space and open it to the community. This plan, along with the support of city and state officials, architects, artists, educators, citizens and community leaders, was presented to both El Centro and the Arizona Historical Society with a sincere request to join them at the table. El Centro responded with an eviction notice for Arts Marketplace, along with a stunning response from Anne Woosley, Executive Director of the AHS. She defiantly indicated that she would not discuss any issues regarding El Centro and the C.O. Brown House, not now, not ever. Such a bold statement from a state official on our dime, wouldn’t you say? Perhaps together we can compel Ms. Woosley to do better. That is no surprise to folks in Phoenix who have been working to save at least portions of the top rated and historic Arizona Mining and Mineral Museum in Phoenix. Using political connections and lobbyists, the AHS gained control of that museum in early 2010. A unique historic and scientific mineral collection, historic one of a kind mining artifacts, popular K-12 earth science education programs, and a historic building all appear to be threatened. The AHS won’t talk to the mining and mineral museum supporters either. Even the stones are being stonewalled. Obviously, the AHS is responsible for the preservation of the C.O Brown house. If El Centro is not managing or preserving it properly, then the AHS is should be held accountable. Perhaps the state of Arizona should consider transferring the property to a more responsible agency. Note: According to the AHS lease agreement (posted on the Brown House blog) El Centro can only lease to nonprofits that will promote certain cultural activities. The Tucson Weekly article however, states that one of the spaces is used by “photographer” Mike Weber. That individual apparently operates or has operated a for profit company that did subcontract work (in conjunction for the AHS) for Rio Nuevo. The lead consultant company under contract with Rio Nuevo was Desert Archeology, Inc. Weber apparently was or is affiliated with Estrada-Weber Cultural Connections of 40 West Broadway Road in Tucson. The address of the C.O. Brown house is 40 West Broadway Road. Perhaps innocent, but worthy of review. Another Arizona Historical Society Fiasco? The Tucson Weekly reported a complex rent dispute between the Community Storytelling Arts and Arts Marketplace and El Centro Cultural de las Americas. The dispute involves space in the historic C.O. Brown house. In addition to rent, the dispute appears to include selling liquor without a license. A particularly curious part of the story is that the house is actually owned by the Arizona Historical Society, a taxpayer funded state agency. The house was given to the AHS on the condition that it be used to preserve culture and arts in Tucson. Apparently, the AHS has leased the building to El Cento for $1 per year for the last 20 years. In a reported quote by an “AHS representative” the article appears to say that the AHS has spent hundreds of thousands of dollars on the building. Assuming the AHS is actually, as reported, spending hundreds of thousands of dollars on a building and then leasing it for $1 per year to another entity that rents it out, why are they doing that? Why are Arizona tax dollars being used to subsidize whatever is being done here? What section of the Arizona Revised Statutes gives the AHS the authority to do this? Why is liquor being served on state owned property? This looks like the same pattern associated with the Marley Center Museum and the 5C Arizona Centennial Museum. Something that is supposedly intended for the preservation of history and education ends up becoming a taxpayer subsidized cocktail lounge for a privileged few. What section of the ARS gives the AHS the authority to serve liquor on state owned property? The practice certainly cannot be justified based on fundraising. If that is the intent, it is failing miserably. The AHS is far from self-supporting, and appears to have no sincere interest in becoming so. Print and digital media students report and write daily news stories, features, enterprise and investigative stories for dozens of daily and weekly newspapers and news Web sites. They also produce video and photographs to accompany their stories. Broadcast students produce TV news packages for television newscasts statewide as well as for the school’s award-winning news program, Cronkite News Watch. The links to the video reports are shown below.